Searching for the right case for your phone is harder than you thought because of the huge selection of cases on the internet. Do not worry about that because we got you. We sorted out the Best iPhone XR for you. For people who prefer to maintain the real look of the device, a clear one would be great. It is different from the usual case that has four uplift corners; this one can still give the same protection with a slimmer look. The case does not affect any of the buttons, and port. You can use, and access them smoothly like there is no case at all. Made from flexible TPU, your device can expect shockproof and scratchproof protection from this product. This next protector of your device is heavy duty and comes with a detachable 3-in-1 design. 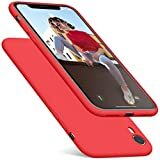 It can add some size to your phone, but you can assure that it fully protects your iPhone XR. It also protects the screen in front with a hard front PC. Made from hybrid materials, this case is worth its price. It can protect it not only from shock, but also in dust, and scratch. It has precise cutouts to allow easy access from buttons, ports, and speaker without the need of removing the shell from the device. At the back of the case, you can see that they have designed it to protect the camera of your phone. 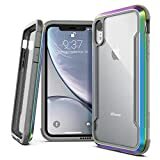 This 6.1-inch Torras clear iPhone XR case is made from flexible TPU enhances the original look of the iPhone. With the clear back case, you can still notice that the device is an iPhone brand, but the stylish edge spruce up the overall look. This thin case fits perfectly, and the user will not have trouble holding, and keeping it because of the natural feeling holding this. The most problem of having a clear case is the wet look at the back, but with the microdot texture pattern, the back cover maintains the clear and natural look. However, although it is a slim case, they have a 0.5 mm screen edge to protect the screen, and 1mm camera lip to protect the camera. This will show off the beauty of your iPhone. Spigen released an ultra-thin case with under 0.15 inches additional thickness to the phone. The clear case boosts the natural look of your device. Made from TPU bumper that can protect your mobile gadget from shock cause of accidental fall, and durable clear PC back to highlight your iPhone. 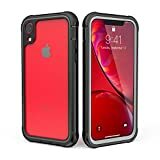 iPhone XR is compatible with wireless charging, and with this case, you do not have to worry about the connection because this case is compatible with wireless charging. The camera of the phone is one of the most important parts of it and with the raised bezel; it enhances the protection of the camera. When it comes to softness, this one has something to say. Made from liquid silicone gel rubber, with microfiber soft lining inside, and cushion hard shell cover at the outside this case will protect your phone perfectly. Because of the silicon, you can ensure that your phone does not slip that easy, and the silky feeling gives a soft touch to the holder. The microfiber lining in the inside protects the phone from scratches, and absorb shock. For a comfortable gesture, the bottom of the case is open, and it has four round corners are covered with silicon. Since the case is soft, you can easily install, and uninstall it to your phone. Down to our top ten, this heavy-duty case was military drop tested. The clear back case to show off the beauty of your mobile gadget and the hybrid edge of your phone to full time protect it. Made from premium hybrid polycarbonate plus thermoplastic polyurethane materials this protector provide a solid texture to protect your device. We are not finished yet, it has a built-in screen protector to keep it protected from scratches, crack, and dirt. The raised lid protects the camera from scratches due to everyday activity. It also protects it from dust, but can still have easy access to ports, and speakers are still in good sound. Even though this case is fully protected, it is still compatible with wireless charging. 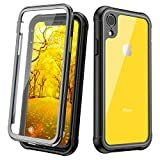 The 6.1 x 2.8 x 0.3 inches iPhone XR case has a triple layer that offers strong protection with a slim fit profile. Made from silicone for curved, and skin feel grip to avoid slipping the device accidentally. The buttons are also covered and protected but it does not a problem because it is still functional, as ever. The three-laters of the case consists of Anti-scratch silicone layer at the back, hard pc layer in the middle, and honeycomb in the last part, which is inside the case. It enhances drop protection and raised bezel for the protection of your camera, and screen. This case from GVIEWIN has a cute flower design perfect for people who want a little girly touch on their device. 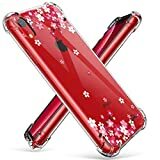 The transparent case enhances the color of the device, which makes it as a background color the pretty flower designs. It blends in every color of your device depending on the design that you choose. It is not all about fashion when it comes to protecting this pretty case will become a hybrid case. It is incredibly protective because it has military-grade protection, and the four corners of the case have a bumper which protects it from shattering. The edges of the screen and camera rose to protect it from scratches, and dirt. Hybrid protection, for a hybrid gadget. 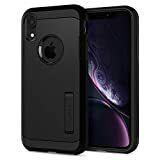 This JUSTCOOL case designed for iPhone XR gives you full-time protection from your daily activity. The clear back gives the real beauty of the phone to boost, and the edge of the device has a military standard, which means it can absorb shock. Made from premium hard PC, plus TPU materials this is one of the reasons why this case is on our list. The 360-full protection is not complete if it does not have a screen protector, of course, it includes a built-in screen protector to protect your screen from any possible damages like crack, scratches. In addition, there is more, this is compatible with wireless charging. A fashionable cover for your phone is a plus, and in our next item, this case is pure of elegance, and protection. The design of the case gives your mobile gadget an elegance look at first glance. The marble back of the case with rose gold lining is an eye-catcher. However, this is not they can only offer as this elegant case can also protect your device from shocks, as it has a military standard, had been drop tested. In front of the case is a screen protector which adds protection to the screen of your iPhone XR. When it comes to the grip, made from soft TPU bumper, it will enhance your grip, and avoid slipping it accidentally. The name of the product says itself because this is one of a tough case. The case is perfect for someone who is looking for a manly type. With less than .015 inches additional thickness, you cannot feel that you have a case on your phone. It also has a kickstand at the lower right part for easy viewing in your phone. It is ergonomically designed for easy grip to avoid accidental dropping. When it comes to shock protection, this has a military grade standard protection, and air cushion technology for anti-shock protection. This case has a lot to say when it comes to protection and toughness. This case is here for a reason. The 6.4 x 3.3 x 0.5 inches case with 360-degree full-time protection will shock you, but do not worry it is shock absorbent. Made from multi-layered TPU, and PC materials that made this an ultimate drop protection. It has a 20-foot drop tested, and even exceed in the military shock standard. Drop tested at a 48-inch height twenty-six times and still working. Since it is 360-degree protection it comes with a screen protector to protect your screen from scratches, and fingerprint marks. Although it may look like bulky, the buttons are still easy to access, same with the port and speaker. In addition, your iPhone XR is still compatible with wireless charging. 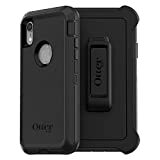 The 2-piece case of OtterBox gives protection to your device. Although it does not include a screen protector, you can always purchase one. The thin and lightweight case provides protection from bumps and shocks. They are offering a commuter series case, which means your device, is protected in any harm that it can meet in the road including dust, and dirt. The ports and buttons of the case are covered to block the entry of dust, and debris. This case can easily slide in and out of your pocket. Our second to the last case is compatible only for iPhone XR. The 6.1 inches case exceeds the military standard test for drops. Your phone is protected for drops from 10 feet high. The speaker holes of the case are in front of the case that amplifies the sound and makes a better sound experience. The simple one-piece construction means there is no tool or screws in the case. 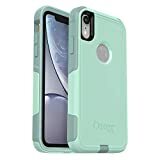 OtterBox makes the best iPhone XR case. The multi-layer case made from hard inner shell inside and softer outer cover outside gives the user a grip when holding the device. The port and buttons are covered to avoid entering dust, and debris that can damage the crispness. This case was designed for total drop protection. At the back of the case, you will see a rotating belt-clip, which can also be used as a kickstand for better viewing. There is a reason why this case is the number one spot. The case is worthy of its price. All of these products are tested and proven to be good protection to your iPhone XR. Each and everyone has a different set of standard when it comes to their satisfaction, we give this selection of product to give you the idea, which is the best when it comes in protecting your beloved gadget. Any of this will make good protection to your device.